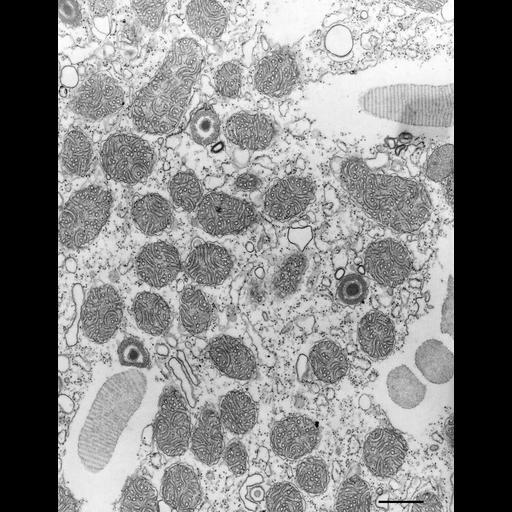 Protozoa, including P. multimicronucleatum, unlike most cells, have tubular cristae in their mitochondria. Tubular cristae, however, do occur occasionally in higher organisms such as in the lutein cells and testes interstitial cells of humans. Mitochondria are particularly numerous in the cortical region of paramecia. Collidine-buffered fixative. This image includes trichocysts that have expanded internally during fixation. TEM taken on 12/18/68 by R. Allen with Philips 300 operating at 80kV. Neg. 16,000X. Bar = 0.5µm.